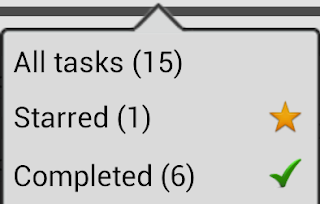 With the release of the Android version of Fliq Tasks 3.0, there is a new feature available that comes in handy if you like to both keep track of completed tasks, but not clutter your task list with those same completed items. Fliq Tasks already had a feature under settings where you could "Hide completed tasks". As of 3.0, there is now a useful filter available that will show you just your completed tasks, regardless of them being hidden from the other filters. Combine these two features, and you can have it such that as you mark an item as completed, they will be hidden from your lists, but still available to quickly view via the new "Completed" filter.